Along with needing a ceiling for their newly renovated apartment, Emma and Andrew wanted to cover up the majority of the brick walls of the garage to make it feel a little less industrial. They needed a range of plasterboard products: ceiling board with soundproofing properties to help complement the insulation and further reduce sound transmission between the flat and upstairs, regular plasterboard to cover the walls in the bedroom and living areas, and plasterboard with some degree of moisture resistance for the walls in the kitchen area. 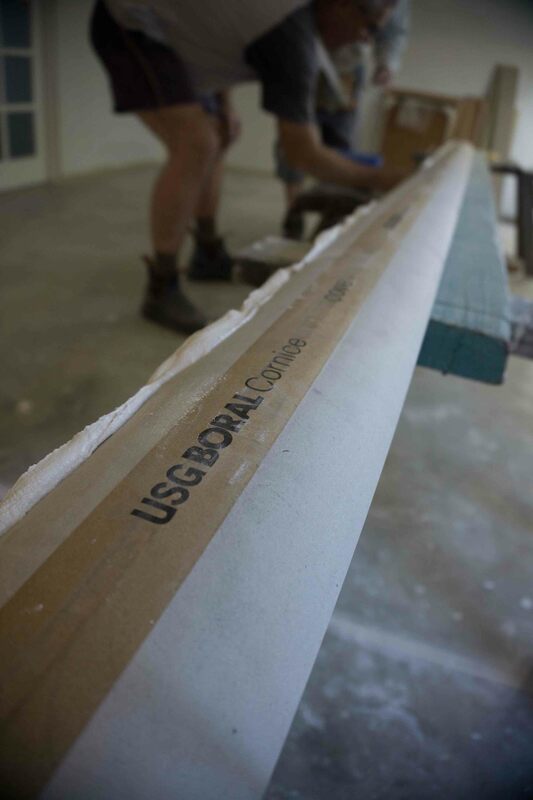 USG Boral had a solution for every area: GECA certified ‘SoundStop®’ 13mm board for the living areas and ‘MultiStop 4™’ for the kitchen walls. ‘SoundStop®’ in a 10mm thickness was chosen for the ceiling thanks to its lower weight, making it easier to lift into place compared to the 13mm version. SoundStop® plasterboard has a denser core and better acoustic insulation properties compared to regular plasterboard, making it an ideal accompaniment for the soundproofing insulation in the ceiling. MultiStop™ 4 also has acoustic insulation and impact resistant properties but was primarily chosen for its moisture and fire resistance, which was great for the kitchen area. 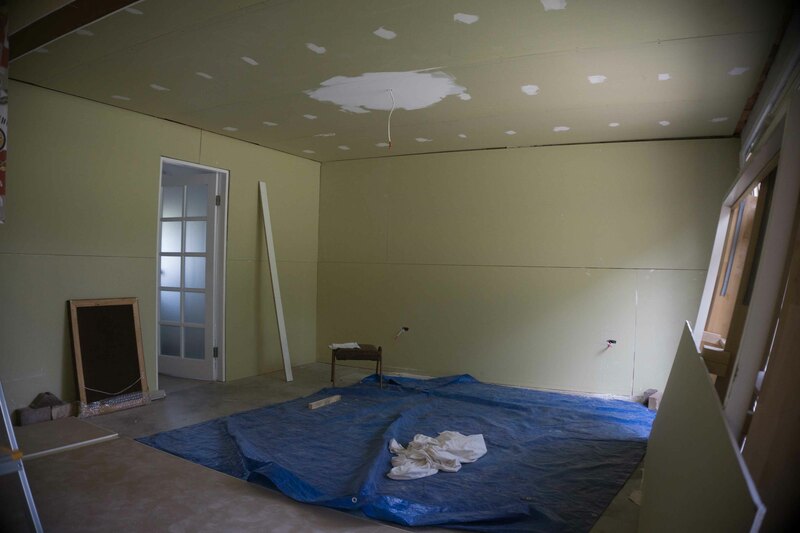 The couple enlisted the help of professional plasterboard installer Gregory Penman to put the walls and ceiling into place. 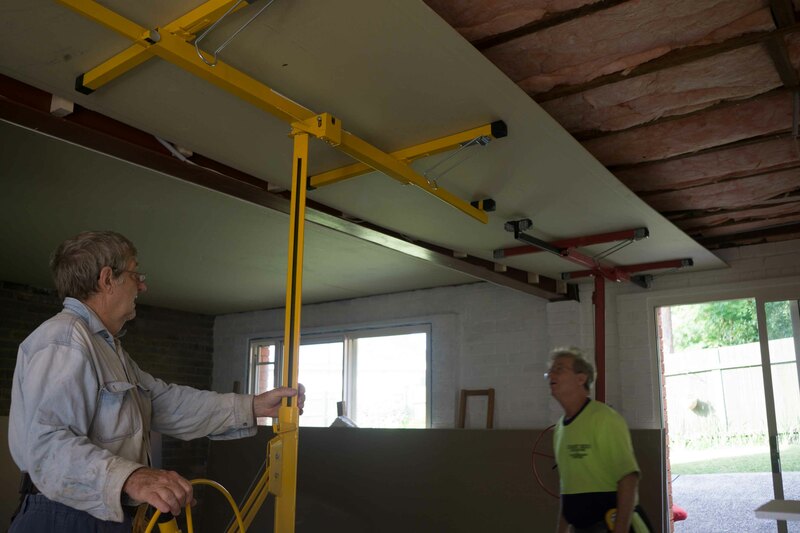 A panel lifter was used to lift the ceiling boards into position where they were attached to the existing wooden joists. To line the walls in the living and bedroom areas, plasterboard was fixed directly to the brick surface with masonry adhesive rather than to wooden frames to ensure the maximum possible amount of floor space was available. They needed to use a different strategy in the kitchen as plasterboard in wet areas requires mechanical fixing (the use of screws, rather than adhesives), which meant the addition of timber frames behind the plasterboard. A range of USG Boral adhesive, cornice, finishing compounds and joinery products were also used to fix everything into place and have all surfaces and joins looking neat. Once all the joins and coatings (such as USG Boral TopCote) were in place, it was simply a matter of sanding down those surfaces to leave them with a smooth finish ready for painting. The end result? Less sound transmission through the ceiling and the space no longer looks like a garage. “We’ve still got one brick wall along the back and a few columns without plasterboard to give the place a bit of texture,” said Emma. But apart from those, which act as feature walls or surfaces, it’s amazing how much the place has been transformed. It now looks like a proper apartment and not a garage! Check out more products and solutions from USG Boral. Click here for part 4 – paint.